An SMA TACKLE High Quality BOILIE from Revolution Baits. New flavour for 2013 and already our 2nd biggest seller - unique and only obtainable from SMA TACKLE. The BNC (Butternut cream). 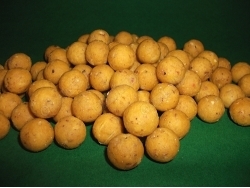 A nut based bait with real ground Tigernuts incorperating some of the most prolific fish catching flavours ever used in carp bait. 5kg bags available in 7 different sizes of boilie! Barrels available in four sizes. Barrels: 10mm x 14mm, 12mm x 16mm, 14mm x 18mm and 16mm x 20mm. Select size and type required at top of page! Select size/type and number of 5 kg bags required and add to cart. Select next size/type and add to cart again etc. etc. 10mm and 12mm carry a surcharge; as shown in list above when selected! Discounts are automatically applied to purchases of this item. Volume discounts will apply for a combination of sizes of this product!. These boilies will take between 8 - 14 days to be delivered to your door from date of order. They are freshly made for each order. PLEASE NOTE THERE IS AN ORDER DEADLINE OF 6PM ON A WEDNESDAY FOR DELIVERY OF THAT ORDER THE FOLLOWING WEEK ON THE FRIDAY! All bait is fresh/frozen and needs freezing. If travelling to venues and whilst fishing any extended sessions the bait MUST be kept cool or allowed to airdry properly. If fishing a venue on the continent eg. France, please ensure that there are freezers available for storage of bait! If these conditions are not met the fresh bait will/may spoil or change its properties! These baits are made to order and perishable (if not stored under the correct conditions) and hence cannot be returned once received (as stipulated in our "Terms and Conditions"). Do not order unless you accept the above!